Feels weightless! My husband loves it! He is in the sun for most of the day; this gives me reassurance that he is protected. It seems to give irritation on my forehead because of acne and often contributes to excessive oil. Great coverage that provides sunblock too. Awesome product! Nice and handy to keep in purse and apply throughout the day! Great texture and matte finish! Can't wait to use this on our vacation as well as at the pool this summer! Great product, and simple to apply. I like the way it looks and feels on my face! I've been using this for years. Wish I had known about the point system when ordering online. Now I only get it from my doctor if I run out unexpectedly which I try not to ever do. It's so easy to use and carry with me. I love that I can just brush it on over my makeup. Can't do that with a lotion! I make sure to bring this in my purse no matter what, especially in the summer and on trips to Florida or anywhere in the sun! It's so small, NO GREASE! Just love this product. This is such a nice light product! I love this for myself and for my kids! Very light weight, light coverage, no sticky feeling! I am so happy I found ColorScience! The UV SPF 30 Protector is perfect for on-the-go applications, and I love the 3 piece kit. I leave 1 stick at home, 1 goes in my purse, and the other in my gym or beach bag. I'm never without it! As a bonus, this formula does not irritate my sensitive skin!! This product is perfect for applying (and easily re-applying) over makeup! It doesn't leave any visible residue, and it works. It's also great for taking into places (e.g, stadiums) that don't allow aerosol containers! Great product but not cheap. I absolutely love this product it is perfect to use while I am out on the golf course. It does exactly what it says. You cant find that in many products these days. This stuff is absolutely amazing! Protects skin for hours! I usually do my regular moisturizer and concealer in the morning then brush this on top of that. You are set for the day and can reapply as needed. You can even mix shades...I mix the medium and tan in the summer. When I’m using in the morning at home I mix and use/swirl in a small glass bowl using the included brush to get a good base coverage. I don’t care for the dispensing mechanism and it’s hard to tell if it’s coming out but this solves that issue for me. Beautiful airbrushed look and amazing protection. For touch ups I do use the brush the regular way without the bowl because that would be weird to take a bowl with me where I go LOL. You HAVE ago use this, no breakouts, feels great, my miracle for sunscreen for real! I’ve tried it all..you name it! I love this product. 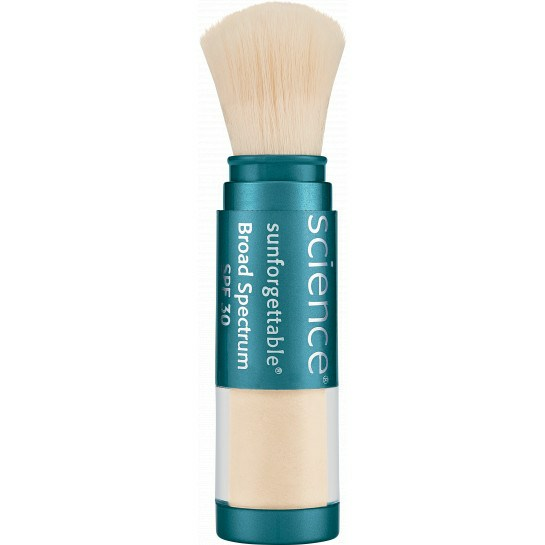 Prior to be introduced the this brush-on sunscreen, I never reapplied throughout the day. Now, I carry this with me everywhere and use it every 2-3 hours. It's a lifesaver! This is literally the only makeup I need to wear--it works as a sunscreen, foundation and bronzer and even covers up dark circles under my eyes. Even though it's pricey, the fact that I don't have to spend any money on a separate sunscreen, bronzer/blush or concealer makes it completely worth the money. Have been using for years! It’s an awesome sunscreen and provides nice coverage. Non irritating, great for outdoor sports! A must have! Was introduced to this product years ago by my dermatologist, and I fell in love! I dreaded wearing sunscreen on my face because they always made me break out, no matter the brand or price tag. This little gem not only provides the sunscreen protection I needed but it also eliminated the mid-day, shiny, oily look. Definitely a must have! This is so easy to use and you don't get creams/lotions etc all over your hands. I like the way it feels on my face and it feels so light. I carry it in my purse and it will also fit right in my pocket. Great Product! I love this product. I am always on the look out for a great SPF foundation and has finally found it! I actually LOVE the appearance of this product. My skin has such a nice, natural glow. Often when I pull this out of my purse for a touch up/protection boost someone will ask what is that, it went on so pretty! I only wish it provided the SPF 50. I can't live without this!!!! I have worn this exclusively since I first tried it in 2014. I am recently 50 and it is fantastic for aging skin. Highly recommend!!!! Love this easy to use mineral brush on sunscreen! I’ve been using it more than 10+ years and tell all my clients about it, it really works. Great for both myself and kids without all the greasy mess of lotions. So easy to pack in the purse and go. I’m buying these for my whole family! I have fallen in love with this product! The powder is so fine that it is light and soft on your skin. I just bought mini brushes for both my sons, and my Mom to put in their golf bags! I can’t wait to try the new formula with Enviroscreen! This is just about the worst make-up product I've ever had. The brush does not work properly, it either releases nothing at all or the whole cloud of powder covering the face unevenly. The plastic looks cheap, and considering the near luxury price range it's not worth the investment. The only positive is that there are not that many mineral make-ups with this level of SPF. Other than that it's not worth it and definitely hugely overpriced. I take this everywhere I go!! Great SPF 30 coverage! I take this wherever I go...whether it's to the beach, on a trip, in the car or shopping! Amazing! No oily feel and no wrecking your makeup. Just brush over set with a mist and youre readdy to sweat or swim without fearing a burn! Its a game changer! So easy to apply and very effective, even on my fair & sensitive skin. Thank you! I love that I can throw this in my purse and be protected from the sun everywhere I go. It goes on easily over my foundation and the added protection is great! I love this mineral sunscreen. I love that it applies like a powder and doesn't make my skin oily like most sunscreens. perfect for on the go. Gives protection, provides a nice finish and great for touching up oily skin. I use the SPF 30 Tan color and it is the best sun protection that you can use! Its so easy to apply and the color gives me a little tan during the summer and winter months. I love it! I use it every day. I rarely wear any makeup because I don't like it feels on my skin and never got the hang of the whole ordeal. On the occasions I do wear makeup, I want it to feel good on and be good for my skin. This powder not only has SPF but also feels light enough that I don't mind wearing it. It doesn't make me feel or look like I'm wearing makeup, and I love it. I have combination skin that is prone to break outs. To top things off I am now getting older, and am getting those fine lines in my face. Colorescience has made a product that helps control the shine without drying my skin, all without causing breakouts, and best of all the shimmer helps camouflage those fine lines that are creeping up. Thank you colorescience for making such an amazing product! This product covers and is light. I do not like to wear foundation so, this product is perfect for me! Protects and takes away shine. It is perfect. I am forever user. Feels so good and looks great!!!!! I don't even know I'm wearing it! Covers imperfections so well too! 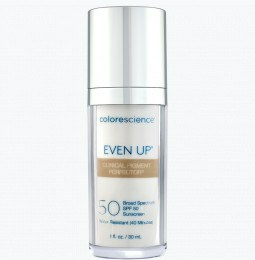 I have been using colorescience sunforgettable for about four years now. I have very fair skin, and I live in the desert. This product protects my skin so well, and feels so clean, like I am wearing nothing at all! I would not use any other product. I love this brush on sunscreen. I have very oily skin and a problem with pores. This brushes on easily without making my pores any more noticeable and really does work. Makes my skin look smoother and keeps the grease away longer than not using anything at all. I love using the tan powder as a bronzer. It gives me the right amount of coverage conveniently while protecting me from the sun. I brought Sunforgetable on my trip to the Carribean, and applied to my face,neck and chest several times throughout the day. Kept me sunburn free and saved my eyes from the burning of lotion sunscreen. Highly recommend! Fast, easy to apply and easy to carry without worry of spill/leaking. Does not make my sensitive skin break out. I took this on a trip to Jamaica in the middle of the winter and I had had no sun in months. I really put it to the test and it worked great. My face did not burn! Or break out! Two thumbs up. I'm a medspa fan when it comes to keeping my skin looking youthful! This brush on sunscreen helps me protect my investment in my skin... and my youthful complexion! One happy outdoor enthusiast! This has become a daily product for me and I just love it. So convenient, goes on smoothly, stays and I feel protected. I had a sample of this years ago and remember how great it felt on my skin and made my skin look even. I just ordered more! This product is fantastic. Easy to use, not messy. Great for the beach or the office. Not only does it protect skin but it also gives skin a beautiful glow and finish. No struggling with goopy lotion of sprays. Just puff them with the brush! Never worry about arriving to your travel destination without sunscreen again. TSA compliant, lightweight and doesn't take up a lot of room. You can wake up from that red eye flight and with a quick brush on, hit the ground running. I own four of these so I will never not have my SPF on hand! I love this in the shade fair. Matches my skin perfectly, doesn't make me break out, controls oil and I wore it in the baking sun and no colour whatsoever! This product is the best. I am totally hooked. So easy to apply and get the coverage you need along with the most important thing--spf! Incredible product! I keep this in my car and can apply it without a mirror- and always have sun protection on my face during the longest summer day. Absolutely worth it. This was the first time ever using this product. I think it took a couple times before I put it on right. Sometimes I wonder if it's going on. But I haven't sunburned so maybe I'm doing right. I use this product on the whole family from 2 to 42. My girls love it because to them it's like putting on makeup. My husband didn't want to use it at first because it looked like makeup but after he was convinced. Great product. 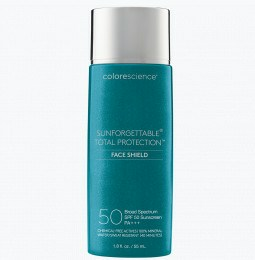 I purchased the colorescience Sunforgettable Mineral Sunscreen on a whim. I knew very little about the company. I cannot be more pleased with this sunscreen. I use it daily, sometimes multiple times depending upon my sun exposure. It is fantastic! I have the whole family using it and my kids love it. I am now using it beneath my makeup (something, I knew I always should do but didn't have the product that I liked well enough to do it). I highly recommend this product to anyone. 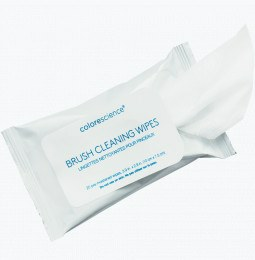 I am anxious to try more colorescience products. How could it be easier? It is so nice to be able to apply & reapply a sunscreen, without worrying about makeup. The minerals go on quickly, sheer, and it looks and feels like only my skin. I have purchased the Sunforgettable Sunscreen Brush for others, or got them started on their own accounts, as I think everyone would love this. I literally just received my Colorescience package in the mail and I couldn't wait to try it. This was my very first purchase and I'm beyond pleased. I ordered the Brush on Sunscreen in medium shimmer. Initially, I was unsure about the shimmer aspect as it appeared a bit more glittery than I was anticipating. I hadn't applied very much though, so I layered on a little more and I can honestly say I'm in love with the result. I decided to buy this on a whim and I'm so very happy that I did. Thank you Colorscience for an amazing product that is not only beneficial for my skin, but also makes me feel naturally beautiful. This is the first sunscreen that I have found that I can use on my face. Simple to use, great coverage and stays on! Thank you colorscience for making such a wonderful product! 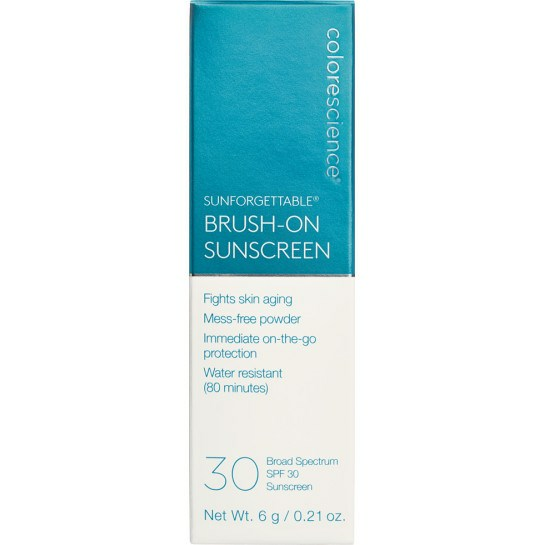 I am so happy that I found Colorescience :) This is the first SPF product that does not cause redness or burning on my face! I'm a busy mom who is always on-the-go and this fits right in! Quick, easy to apply, integrated brush, no worries about washing hands before or after. My son who does not like the white, shinny and sticky feel of liquid sunscreen watched the video and asked me for a Sunforgettable Brush for his camping trips. Now, the whole family asking for one. Love it. Wish it was easier to apply over wet face but love it anyway. This product is so easy to carry around. Not too big. You just pull it out, dust it on and off you go!! 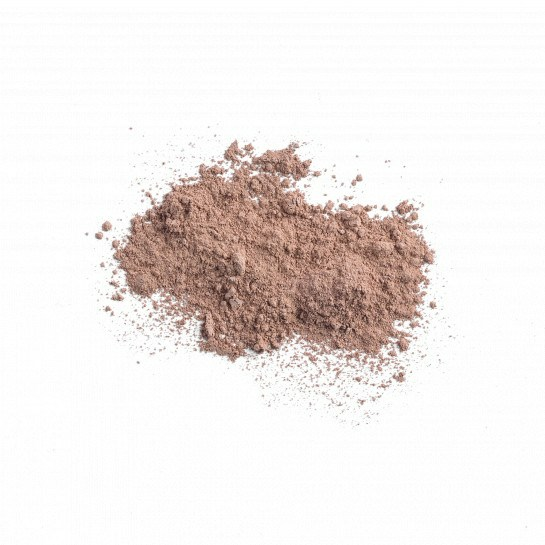 I have been using the Sunforgettable mineral powder for a couple of years now and I love it! So easy and convenient! I purchased the multi-pack so I can have one at home, one at work and one in my car. That way I don't ever have to go without it! I bought the trial size of this product because I was a little skeptical. I am fair-skinned, and I work outside in South Texas. But, I think this product is amazing! I love that it stays put and really does offer sun protection! I am a true believer now! This is a wonderful product. I love that I can put a sunscreen powder on my face instead of an oil or a cream sunscreen. The Sunforgettable is light and I don't have the feeling that its clogged pores like I do with other oil/cream sunscreens. I can wash my face brush on the Sunforgettable® Mineral Sunscreen without any other make up. It looks great. I recommend this product highly. With the summer coming up, I love using the Sunforgettable. It is convenient and I get all the protection I need. Thank you for a great product. I use this on a regular! I love how it feels and what it does. I enjoy knowing I am being protected and looking great with a flick of the wand! What a great find and buy! Thank you colorescience!! Great on the go sun protection. Doesn't irritate, feels like nothing, and can easily layer over makeup. Only wish the brush was a bit softer. This product is so easy to use and goes on like a sheer face powder, but with great sun protection. I keep one at home, one in my purse for touchups and one in my tennis bag. I've been taking this sunscreen on trips for nearly 10 years. I constantly amaze my friends with the ease of use, transparency, and its ability to keep the sun's harmful rays at bay. I'm talking about uncountable water experiences year after year. Of course, my skin is going to age as I do, but Sunforgettable protects it from burn and the harshest effects when most needed. I've ordered some new products, and can't wait to try them! The sun can be pretty intense with the Florida heat, and this sunscreen is so easy to wear. It has literally saved my skin from getting blasted! It's awesome and helps your skin look even better. I really like this product. I have oily skin, so it is hard to find a sunscreen I can use that does not make my skin feel greasy. This was the perfect solution. I use it alone sometimes or over the tint de soleil. I have nothing but good things to say about this product. Definitely recommend! I love this product. 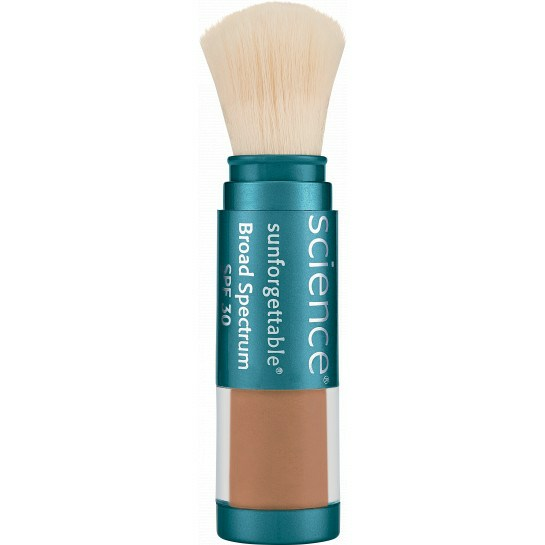 I was using the Loose Mineral Foundation Brush SPF20 which I did like. I switched to the Sunforgettable Brush on Sunscreen and I feel like I don't even have makeup on. It's great that it has SPF in it and I don't need to put any liquid sunscreens on after moisturizing which I find make the skin oily and acne prone. I have noticed my acne getting better. Money well spent. you got what you pay for!!! Protects your skin, stays on longer and very good coverage. What else you can ask for? Absolutely obsessed with this product. I never throw around the word holy grail but this is the rare exception. My ONLY gripe about this stuff is that I'm not too thrilled with the dispense mechanism it comes stored in. I just wish that this phenomenal company would sell their spf 30 sunforgettable in a loose jar. That way I can control how much I want to dispense and use my preferred flat head kabuki mineral brush. And if I wish to continue using the to-go brush it traditionally comes with I can just refill it with the separate loose powder. I'm begging you guys to bring the loose powder jar back and in doing so you guys would be doing an even better job as a responsible company by helping your customers to reduce our carbon footprint by producing less waste. We don't need a new brush dispenser every time we run out of product. I'm sure most of us beauty guru's can attest to much rather needing to have the option of the loose powder in a jar to be able to control the magic powder how we so choose. Regardless thanks for creating such a life changing product. I'm beyond picky and this stuff really has me in awe. I love colorescience sunforgettable. Have used it for years. SPF30 is enough for me and I live in a tropical climate. I don't need the SPF50. My only problem is the price. Makes me ration the product and not get to use it as much as I would like. I used to love when they sold the product loose in a can and I could use my own brush to control the amount I used. I cannot control the use of this expensive product with the built in brush. Perfect for on-the-go sun protection and light coverage. I have used this product almost everyday for three years and have never been disappointed. Great powder, absolutely poor quality brush and the top?cap has broken on EVERY container I have bought. CS: We are sorry to hear that. We recommend keeping your brush in your makeup bag or in one of the pockets in your purse to prevent damage. Hopefully that helps and thank you for loving our products. This product is perfect! A daily staple, in my makeup bag, fast and easy to apply, and really protects against the elements! I carry this in the zippered back pocket of my cycling jersey every time I cycle! I use a primer, Even Up, and this product to touch up and keep my skin looking flawless and protected from the elements! I highly recommend it! I love the product, just have trouble with matching it with my face. I love this product. I have been wearing it exclusively for 3 years now. It is so easy to apply and always looks fresh and I love the sunscreen benefit. I would highly recommend it to everyone! This is the most amazing product for sun protection ever invented. 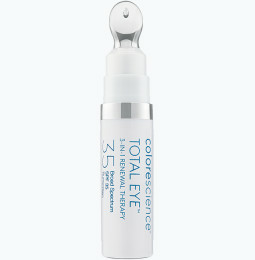 I am a Registered nurse with 40 years in the health care field and recommend Colorescience to everyone. It is more costly than other sunscreens, however, I have used it almost every day for just about a year and will just now need to reorder. Actually very cost effective. There is no way to explain how good this stuff feels on your face. I am purchasing some for my 85 year old mother who has had cancer on her face and refuses to wear lotion type sunscreens. My grandchildren loved it when we went to Disney. I had a serious problem using this product. Colorescience is my favorite beauty product. I highly recommend it to every female and male who wants sun protection with smooth/silky complication. I receive many compliments from strangers and friends about my complication. Thanks Colorescience. My sister got this for me! I am obsessed. I love the entire product line. But this is by far one of my favs. Well worth every penny.